A bit of a shakeup took place in this year’s AIN Product Support Survey for the aircraft manufacturers, with Gulfstream back on top in the combined overall average for newer and older aircraft. Gulfstream’s 8.4 average (out of a possible 10) for its large-cabin models was 0.1 points higher than last year and vaulted it back into first place. Last year, Gulfstream’s large-cabins came in second place. Dassault Falcon and Embraer tied for second place at 8.3, representing a 0.2 jump for Dassault and a 0.1 drop for Embraer. Dassault has been making steady progress and moved up from third place last year to second place this year. Gulfstream’s midsize jets scored an 8.2 overall average rating this year, up 0.2 from last year, putting them into third place. Also moving up in the scores this year are Bombardier’s Challengers, up 0.1 to 8.0 but in fourth place like last year, and tied with the Global jets. The company’s Learjets remain at 7.7, but these moved up to fifth place from last year’s seventh. Textron Aviation’s Citations, while dropping 0.1 this year, tied for fifth place with Learjet, up from last year’s sixth place. There were many ties this year, and in sixth place this year for the overall average of newer and older aircraft are Textron Aviation’s Hawker and Premier/Beechjet/Hawker 400. Maintaining their steady lead across the years, Mitsubishi’s MU-2 series topped the turboprops' overall averages with a 9.1, down 0.1 from last year. Pilatus came in second with the same ranking as last year, and 8.2. Textron Aviation’s King Airs managed a 0.2 climb to 7.4 this year. Daher’s TBMs did not receive the minimum number of ratings to be included in the final turboprop results. The helicopter manufacturers are also in the same order as last year, with Bell in the lead but down 0.1 to 7.1, followed by Airbus Helicopters (also down 0.1, to 7.0) in second place. Leonardo remains in third place at 6.9 (down 0.1), but Sikorsky is closing the gap with a large jump from last year, up 0.5 to 6.8. For jets that that were delivered in the past 10 years, Dassault and Gulfstream large-cabins tied for first place, ranked at 8.5. This number is a slight drop from Gulfstream’s 8.6 last year, but a larger 0.2 move up for Dassault, which was in third place last year. In second place, Embraer scored a rating of 8.4, exactly matching last year’s number and ranking. Gulfstream’s midsize jets came in third place at 8.2, up 0.2 from last year. Bombardier’s Challengers moved up significantly in this year’s rankings, to fourth place and 8.1, up 0.3 from last year’s sixth place. The company’s Globals at 8.0 ranked in fifth place, down 0.2 to 8.0 from fourth place last year. Textron Aviation’s Citations maintained the 8.0 overall average from last year, ranking in fifth place, also the same as 2017, and tied this year with the Globals. In sixth place were Bombardier Learjets at 7.6 (up 0.3), followed by Textron Aviation’s Hawkers at 7.2 (down 0.5). Gulfstream large-cabins received the top score, an 8.2, in the older jets' overall average, a 0.6 jump from last year’s fourth-place ranking. Embraer secured a second place finish with 8.1 (it wasn’t listed on last year’s chart due to not receiving enough responses). In third place in the older jets category were Bombardier’s Globals, at 8.0, up slightly from last year’s 7.9 but at the same time down from last year’s second place. With a 7.8, the Learjets came in fourth place, down 0.2 from last year and also a drop from first place in the 2017 rankings. Dassault Falcon tied for fourth place this year, scoring the same as last year but down one place from third in 2017. 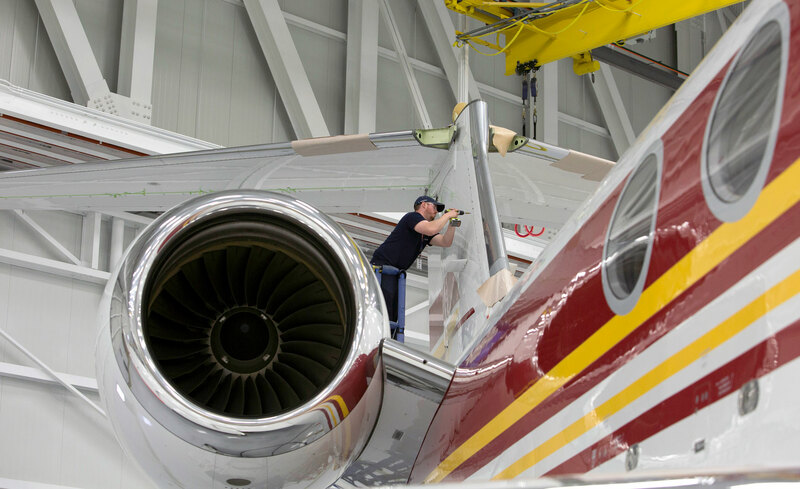 With a 7.7 (down from 8.0 last year), Bombardier’s Challengers ranked in fifth place; last year this marque scored first place along with its Learjet siblings. Textron Aviation’s Citations and Premiers/Beechjets/Hawker 400s both saw scores drop from last year, down 0.3 for the Citations and 0.8 for the out-of-production light jets. The regular Hawkers saw a 0.3 increase. Pilatus remains the leader in this category, bumping up its overall ranking from last year’s 8.1 to 8.2. Textron Aviation’s King Airs garnered the same 8.0 and second place as last year. In the older turboprops category, there were no surprises this year, with perennial favorite Mitsubishi’s MU-2s holding their big lead at 9.1 (down 0.1 from last year), followed by Textron Aviation’s King Airs (7.2, up 0.4 from last year).